Disclaimer: this article is longer and scarier to handle than three ninjas taped together to make one giant ninja. You've been warned. We've chatted about card advantage a few times and how important it is when building a deck. Another factor to consider is synergy. It's not just for bosses who are talking to corporate and directing workflow. Today we're going to go over one of the greatest examples imaginable: Caw-Blade. Caw-Blade was a deck that dominated an entire format (Standard) to the point it was the only deck capable of placing in the Top 8 of any tournament. It wasn't the fault of any particular card or designer of the set. It was a completely unexpected beast where every card worked together like an oiled machine. The last time this happened was wayyyyyy back when the original Mirrodin block was released and it was entirely the fault of the designers of the set. They underestimated just how useful the artifact lands were and they managed to break the format in half by making Affinity the only deck to play. This time around it was because of unexpected synergy. After the deck had dominated long enough, they decided to ban two of the key cards in the deck and guess what happened? It still kept doing well. It wasn't the only deck in the format anymore but the synergy was undeniable. So how did this deck work? Well to explain that we're going to have to take a look at every card (the beauty of the synergy here is that every card was a key card which meant the deck didn't have to rely on a single strategy to win). 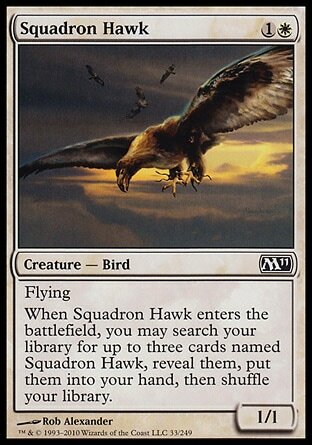 Squadron Hawk was originally the only creature in the deck (keep that in mind) and was the reason for the Caw in the title (Originally it was called Caw-Go which is a play on the common archetype Draw-Go). Squadron Hawk's card advantage is insane. It gives you three other creatures in your hand, all with evasion, and it thins the deck by up to three cards. All of this for the low cost of 2CMC. 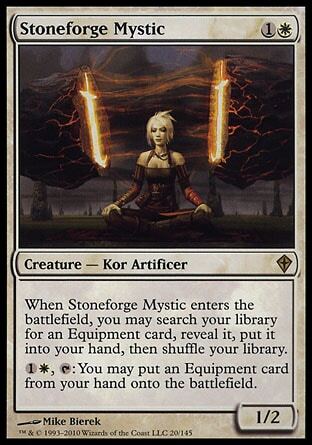 Stoneforge Mystic is already a broken card (as in... too powerful) on its own. It lets you search for any equipment card, play it for only two mana regardless of its CMC, and you can even drop it during the opponent's turn (giving all of your equipment Flash while making them cheaper at the same time). Why did they suddenly include the Mystic? That would be because of the next card. Sword of Feast and Famine was considered weak at first glance in comparison to the other swords in its cycle (Sword of Fire and Ice, Sword of Light and Shadow, Sword of Body and Mind, Sword of Feast and Famine, and Sword of War and Peace which came out after) but they didn't expect how this deck would use them. The deck carried one copy of each sword (each one in Standard, that is, which means zero copies of Fire and Ice or Light and Shadow) and the Mystic could hunt down the necessary weapon. It gave the Hawks or Mystic protection from whatever colors it needed at any given moment (making them immune to spot removal) and the Sword of Feast and Famine combined with a Hawk meant the Flying creature with protection (making it even more evasive) was almost always going to hit the opponent which would trigger the ability to untap all of your lands (and don't forget that free discard effect). That deserves a pause. I did mention that originally this deck was called Caw-Go. Draw-Go decks were given their name for a reason. The strategy was that they would play everything at instant speed during the opponents turn. That way they could react to anything the opponent did and always make the best play. Each turn looked like this: Untap, Draw a card, annnnd Go! They would draw their card and pass their turn which is where the name came from. Now imagine a deck that could cast anything it wanted on its turn, get its mana back for free, and then play like a draw-go deck afterward. It would be like facing two decks at the same time. Caw-Blade got the title because it could use the Sword of Feast and Famine's ability to untap its lands and pull off that exact strategy. It could cast whatever it wanted on its own turn, swing with the Sword equipped to a Hawk, untap everything, and play like a draw-go control deck during the opponent's turn. The scariest part about all of this, is that is only the beginning. Let's go over the basics of the control aspects. Mana Leak and Spell Pierce were the counterspells to handle any situation during an opponent's turn. It was also able to abuse Day of Judgment as board sweep because it could immediately replace the Hawk with one of the extras the original one searched for. Even better, it ran sleepers to ignore the board sweep entirely. One of those sleepers was the land Celestial Colonnade. Not only did the land produce the mana it needed but it could turn into a creature in a pinch and pick up the sword. For those not familiar with the term, it's called a sleeper because it typically "sleeps" by not being a creature until it needs to wake up and start hitting things. Let's not forget the control effects of each sword as they typically had extra effects that could change the outcome of a battle on their own. Then Preordain starts the first turn off right every time to add even more consistency to one of the most reliable decks ever built while Condemn gives the deck spot removal to give it the deadliest combo of powerful spot and mass removal (Day of Judgment). That covers another huge chunk of the deck but it keeps going. Let's go back to those blades for a moment. 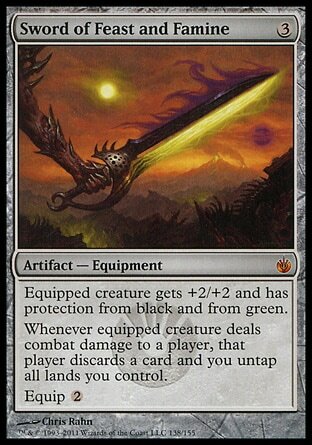 Not only did you have 3 different blades for different protection effects and spell effects that could win or alter the game but you had another deadly equipment that came out around the time the Sword of Feast and Famine came out: Batterskull. The weapon choices were already putting the deck over the top but this skyrocketed them to the moon. Just try to imagine how scary this scenario is: Stoneforge Mystic is out, the opponent swings with their creature, you pay two mana for the Mystic's ability and you put Batterskull onto the field out of nowhere. You're paying 2 mana for a 4/4 Flash (thanks to the Mystic), Vigilance, Lifelink creature that destroys any plans your opponent could dare come up with. But it doesn't stop there. This deck ran two Planeswalkers. 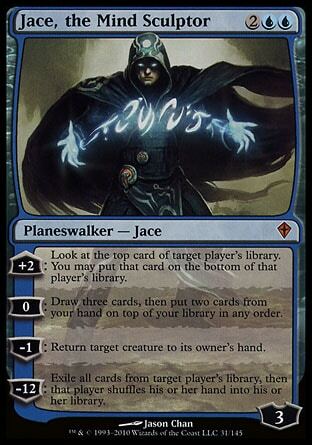 One of which was Jace, the Mind Sculptor (the most powerful Planeswalker ever printed). Jace worked perfectly with the deck. At bare minimum he could adjust what cards you were going to draw or give you extra cards every single turn. That's already powerful for any control deck but this deck already had more than enough card advantage with each card working so efficiently together. This helped seal the deal and make the deck even more consistent. Between the card draw and search effects, luck was never going to hinder you. Jace could bounce a creature in an emergency and was even an alternate win condition. One thing that people didn't expect was that Jace would be used to "Fateseal" the opponent with his +2 ability. You'd effectively be controlling what your opponent would draw so you could screw them over each turn. The craziest thing however that proves just how deep the synergy would run is that Jace could use his draw ability (draw 3 and then put 2 back) and put back the Squadron Hawks into the deck since they could be searched for again and it would give you the extra cards you didn't have access to. You were even abusing Jace's basic draw ability here. Mind blown! 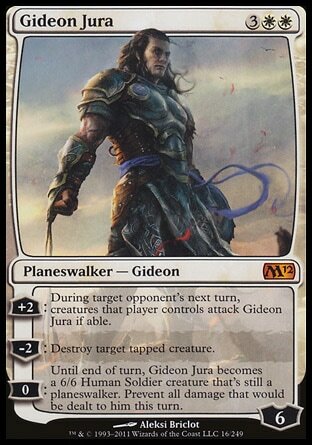 The other Planeswalker was Gideon Jura. While Gideon isn't the most broken Planeswalker to be printed, he's exactly what this deck already wanted. Both Planeswalkers make the player that much more untouchable but Gideon takes the cake for protecting the player. The +2 can screw over your opponent's plans, he can tap out their creatures to let your Hawks or whatever get through with the different Swords (to get their bonus effects), and he can setup a kill with his -2 ability. Him having the -2 at all makes the opponent afraid to attack which gives you even more protection. Gideon and Jace working together makes most creature decks just cry in despair. The best part is the last ability that can be used at any time you need it. Gideon can turn into a creature, pick up one of the Swords, and be almost unkillable. The deck was already abusing the swords but the fact that it has a Living Weapon equipment, sleeper land, and sleeper Planeswalker really just push the sword wielding to another level. Every card was already powerful individually and most were capable of generating card advantage (sometimes excess amounts of it like Jace or the Hawks), it could employ the greatest strategies of an aggro deck and a control deck, the equipment meant its creatures were superior to the opponents, it played the best control cards in the format and had access to the best spells in general, it had every angle covered no matter the situation, it was crazy consistent, and above all else, every card mattered and worked in unison with the other cards in the deck. Remember when I mentioned how powerful the Affinity deck was at the beginning? How it was the only other deck to ever pull off what Caw-Blade did and ruin its Standard environment as the only playable deck? It still had a weakness. It was like most decks. Once you figured out how crucial the artifact lands were, you would destroy those lands (with artifact and/or land destruction) and it would fall apart. Caw-Blade didn't have a weakness because all of the cards worked with one another. There was no key strategy and the deck could adapt on the fly to any situation. Even if you somehow got past the counterspells, draw-go style of play, the free spells it got to play thanks to untapping, and all of the other factors to take out the Sword of Feast and Famine and the Stoneforge Mystic, the deck didn't care. It was already a winning deck when it was just called Caw-Go. Feast and Famine and the Mystic just made it that much scarier. They were the icing to an already delicious cake. Even if you could take out every Hawk, it had several backup Sword wielders and a couple of alternate win conditions. If you were playing Aggro it would outclass your creatures, if you were playing Control it would outplay your every move, and Combo didn't stand a chance. The most interesting thing about this entire story, to me personally, is that the pros loved that it dominated the format. You might think that sounds crazy but this was a deck that rewarded skilled players. It's definitely true that it gave non-skilled players a winning deck from the get go but that's not looking at the bigger picture. Most tournament players are already netdecking regardless and the top players of the world were able to abuse this deck better than any amateur that would pick it up. Everyone was wielding the same weapon but only the true pros could master it. It's just the strangest tale of the best and worst thing to happen to Standard simultaneously. This is Kylak signing out and thanking you for sitting through all of my ramblings.